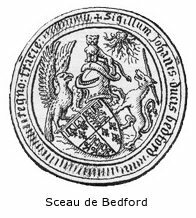 es historiens citaient à l'envi quelques lignes de Bedford disant que les affaires d'Angleterre avaient prospéré en France jusqu'à l'arrivée d'un suppôt d'enfer nommé la Pucelle. Dans quelle circonstance le régent avait-il écrit ces lignes ? on l'ignorait. On renvoyait à Rymer ; or Rymer assigne au passage cité une date impossible, l'année 1428, alors que la Pucelle n'était connue qu'à Domrémy. 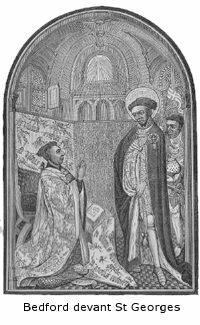 Frappé de cette anomalie, M. l'abbé Debout passa en Angleterre, compulsa les archives de 1429, 1430, 1431 et acquit la conviction que non seulement la pièce ne s'y trouvait pas, mais qu'elle n'y a jamais été. La publication de cette observation atteignait tout à la fois la valeur du document et l'autorité du célèbre annaliste anglais Rymer. Des recherches ultérieures furent faites, et, au grand plaisir de M. Debout lui-même, elles ont fait mettre la main sur le document qui par sa vraie date n'en acquiert que plus de valeur. C'est ce que fait ressortir le scrupuleux chercheur dans sa plaquette : "Appréciation du duc de Bedford sur Jeanne d'Arc et son oeuvre". La pièce existe aux Archives anglaises (Bibl. cott. Titus, E, 5) ; elle était même imprimée dans les rotuli parlamentorum, appendice du tome V (p. 435). Bedford l'écrivit non pas lorsque Jeanne d'Arc était sur la scène, mais quatre ans après son supplice, alors que la première impression était dissipée, et qu'il examinait froidement la cause du revirement de fortune subi par l'Angleterre. My right doubted and Soverain Lorde, lyke it youre Hieghnesse to be remembred, how that not long agoo, for dyscharge of my selven as towarde any defaulte or blame that by any suggestion or informacion, suche as yne have yave matere ne cause to, myght to the hurt of my nane or fame, or withdraught of youre gracious benevolence and favour, withoute my desert, be layede upon me, touchyng my demenyng in the governance of youre Reaume of France, I declared myself and my demenyng in youre saide Reaume of France, by a writying departed into certaine Articles; the whiche writyng with all humbiesse y presented to youre Hieghnesse. In the whiche, for declaration of the conduyt of the werre in youre saide Reaume, for the tyme of youre noble Regne, hit is contened and is soche, that after the decesse of my Lorde youre Fadre, to whoos Soule God doo mercy, by the Grace of God, and by the gode labour and diligence of youre trewe Men and Servantz there, and me oon of hem, wyllyng to doo the goode that Iconde, divers grete and faire dayes. And victories were hadd there for you and in your querell upon your ennemys, and youre obeissance theire notably enlargissed and encresed and brought thereto greet partie of Boye, Champaigne, Aûcerroys, Doûziout, Nyvernoys, Maconnoys, Anjou, Maine; and alle thing there prospered for you, til the tyme of the Siege of Orleans, taken in hand God knoweth by what advis. At the whiche tyme, after the adventure fallen to the persone of my Cousin of Salysbury, whome God assoyle, there falle by the hand of God as it semeth, a greet strook upon youre peuple that wos assembled there in greete nombre, caused in grete partie as y trowe, of lake of sadde beleve, and ofunlevefull doubte that thei hadde of a disciple and lyme of the feende called the Pucelle, that used fals enchauntements and sorcerie, the whiche strooke discomfiture, nought oonly lessed in grete partie the nombre of youre peuple there but as wel with drowe the courage of the remenent in merveillous wyse and couraied youre adverse partie and enemys to assemble hem forthwith in grete nombre to the whiche divers of youre greete Citees and Townes as Reyns, Troyes, Chaalons, Laon, Sens, Provins, Senlis, Laigny, Creyl, Beauvais, and the substaunce of the Cuntres of Champaigne, Brye, Beauvoisin, and also a partie of Picardie, yolde here withoute resistence, or abode of socours; howe were it that incontinent after the saide discomfiture of Orleans, I doubtyng of theire discouraies, sent to thayme divers your Conseillers of the same Cuntrees, offryng hem garnison of Men and Socours. And over this with thoo that were left me of youre peuple, forthwith the refresshyng of the retenue that myne Oncle the Cardinal hadd made for the Chirche, the whiche was notable, and eam thider in full good seison, sett and kept my self o ye feelde divers days, ayens youre ennemys, that purposed to have geten the remenaunt of the Cuntree. I redy there to have employed my persone in youre querell, and to the sauvacion of your Lande, and of youre trewe Subgetts there, and Sidde therto the goode that y conde; so that with Godds grace, it shal not be fonden that ye have lost in my defaulte the said Citees, Townes or Cuntrees; the lose and departyng of the whiche, and the neghing and dayly prees of the Werre therby to youre gode Toune of Parys, and to the remenant of your Cuntree of France, youre Subgitts of the same neither myght tille theire Lands, ne theire Viegnes, ner occupie hem with bestaille, ner otherwyse, ner yuneto hemselfe, ner outter any kyns of Merchandises hath dryven hem to an extreme povertee, suche as thei may not long abyde; as it is not unknowen into youre Counseil that was wich yowe but late agoo in youre saïde Reaume; and causeth hem that with alle her hertes desire to kepe hir trouthes and obeissance unto you, to aske of yowe for non power of thayme self more chargeable and abydyng socours than, ever thay didde before and made me with ofther of your Counsaille of youre Reaume of France, to assemble at Caleys, with my Brother and other Lordes of youre Counsaille of this Lande; and for lakke of Comfort there emonges other causes that moeved me, I cam into this youre Reaume, to shewe this unto youre Hieghnesse, to th'entent of provision to be hadde ther upon, suche as it shulde lyke you by th'advis of youre Counseil here to ordein. « Plaise à Votre Altesse de vouloir bien se souvenir qu'à une époque récente, je lui ai rendu compte de mes actes comme Régent résidant dans son royaume de France, par un mémoire précis, divisé en un certain nombre d'articles : je craignais d'avoir perdu la bienveillance de Votre Altesse et la faveur dont je jouissais auprès d'Elle, et dans l'espoir de me disculper, si quelque faux rapport avait été fait contre moi par des malveillants qui essayeraient de ternir mon nom et ma réputation, j'ai tenu à vous présenter humblement un compte rendu ou rapport, sur ma conduite et la direction que j'ai donnée à votre royaume de France. Dans ce rapport, où sont consignés tous les faits relatifs à la guerre qui a désolé votre royaume pendant votre règne, j'ai constaté que tout d'abord nous avions traversé une heureuse période, où de grandes actions ont été accomplies par vos fidèles hommes d'armes et vos serviteurs, parmi lesquels j'étais, et ce, par la grâce de Dieu. Après la mort de Monseigneur votre père, que Dieu absolve, nous avons remporté des victoires en votre nom, et combattu pour vous dans votre lutte contre vos ennemis : les territoires soumis à votre obédience se sont notablement accrus, votre autorité a été reconnue par une grande partie de la province de Brie, par la Champagne, l'Auxerrois, le Donziais, le Mâconnais, l'Anjou, le Maine, et tout prospérait pour vous en France, jusqu'à l'époque du siège d'Orléans, commencé sur l'avis d'un conseiller funeste, Dieu sait qui ! Source : Présentation et texte original de J.B.J. Ayroles, "La vraie Jeanne d'Arc" - t.III, p.562. Traduction de M. Chaulin publiée dans le même ouvrage.